The Louisville AIDS Walk is coming up, and the Women’s Center is looking forward to once again joining hands and fund raising forces with More Light at LPTS and with Women at the Well to make a contribution to the funds available for helping people with HIV/AIDS here in the Louisville area, raising awareness about the preventability of HIV/AIDS and its circuitous links to oppressive gender- and race-based structures, and building community and solidarity by getting out in the fresh September air and doing something good together. If you will be in the Louisville area on Sunday, September 25, join us at 2:00 p.m. at the Belvedere to get together for our team picture, and to be ready to start out with the other walkers at 3:00 p.m. Whether or not you can join us for the walk, please consider sponsoring our team or one of the walkers, and make a difference in the lives of people living with HIV/AIDS in the Louisville area. The answer to that question is partly historical, and partly theological. The historical part is that the Women’s Center started walking in the Louisville AIDS Walk as part of its collaboration with the More Light and Women at the Well groups on campus. Both of these groups have ties to the Women’s Center because of our common concern about the way gender, and the role people think it should or must play in society, affects people’s lives, livelihoods and life prospects. Women at the Well is a group for solidarity, support, education and advocacy for African-American women in the Seminary community. More Light has been and is an organization that educates and advocates around issues of special concern to LGBTQ people. In other words, part of the reason we started walking in the Louisville AIDS Walk is that it became a priority for us because it was a priority for our partners in mission. We keep walking because it keeps mattering. Stay tuned for the theological part! While the Fifth Annual Katie Geneva Cannon Lecture and Interfaith Conference “A Woman’s Voice” is immediately on our minds at the Women’s Center, we are looking beyond that event as well . . . at least as far as September 26, the date of the 18th Louisville AIDS Walk. Go to the Women’s Center’s team page and Join the Team — then, contact family, friends, colleagues, and other supporters and ask them to sponsor your walk over the Clark Memorial Bridge on Sunday, September 26. Go to the Women’s Center’s team donation page and make a contribution. In addition to that support, you can encourage your family, friends, colleagues and other supporters to check out this post and the team pages, and consider walking and raising money with us! See you in September — first at the Katie Geneva Cannon Lecture and Interfaith Conference “A Woman’s Voice” on 9/12 and 13, for which it’s not too late to register, and then at the AIDS Walk, 9/26, when a Sunday afternoon walk through Louisville will mean a lot to our Louisville area neighbors with HIV-AIDS. beverages and snacks all night!!! We’ve heard that voting for the “Court of the Elect” closes tonight at 8:00 p.m., and that all donations will be matched by an anonymous donor, so voters are encouraged to vote early and often. The event, organized by the LPTS Community Affairs Committee, is the Spring semester’s big event designed to focus attention on the problem of HIV/AIDS, educate about the global scope of the AIDS pandemic, and take action towards addressing it. The Gender and Ministry Committee is a co-sponsor. Women’s Center drop-in hours will be a little shorter on Tuesday next week — which is good news for the folks who will be at Montreat attending the “Transitioning from Solo to Multi-Staff Pastor” conference. That’s because Rev. Deborah Fortel, who has been keeping the Center open on Tuesday afternoons, will be co-leading that conference in the hills of North Carolina. We are wishing her, her co-leader Rev. Harris Schultz, and the group well! Books on the environment, the economy, and equity. Folks interested in Marsh’s article might also be interested in Sojourners’ ‘Christians and the Environment’ PDF discussion guide, available from the SoJo Store for $9.95. LPTS will observe the day with a unique worship service this morning at 10:00 a.m. in Caldwell Chapel. The Cultural Diversity Committee will screen the award-winning film Philadelphia, to be followed by discussion of key issues raised by the film. In large measure, AIDS is a disease of “the least;” it afflicts people who have been neglected, marginalized, coerced physically or financially, and then silenced by the stigma that still attaches to HIV/AIDS infection. Concern for people living with HIV/AIDS, action to relieve suffering caused by HIV/AIDS, and commitment to progress in ending the epidemic, are all concrete expressions of Christian commitment to justice as well as compassion. This year’s Louisville AIDS Walk organizers remind us that HIV/AIDS remains a growing problem in the Louisville metro area. Since 2000, the number of people in Louisville living with AIDS has increased 64%. The number of HIV cases in nearby Indiana counties has gone up even more: in Clark County, by 127%, and in Floyd County by 132%. While knowing that there are now drugs that have an effect on the progression of the illness, and hearing from HIV+ folks, may give the impression that AIDS is not as serious a disease as it used to be, this would be a mistake. Over 1 in 5 of the individuals diagnosed with AIDS in Kentucky in the year 2000 died within five years of their diagnosis. While the good news there is that 4 in 5 have a better prognosis, a disease with a 20-25% mortality in a short time, according to my physician source, is a bad one — in the same neighborhood as smallpox. Between now and September 28, we have an opportunity to do something concrete to be part of the effort to aid HIV/AIDS sufferers and their families, and to promote the cause of healing. 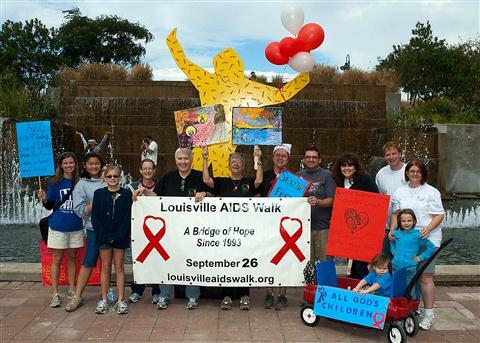 The Women’s Center is once again organizing a team of fundraiser/walkers for the 16th Annual Louisville AIDS Walk, which will happen Sunday, September 28. Registration and entertainment will begin at the Belvedere downtown at 1:00, and the walk proper begins at 3:00. We hope you’ll help us in our effort to raise money for this cause by joining the team, asking family, friends, and acquaintances for support, and contributing to our team’s online donation page. See you Sunday, September 28!